Tonkinese cat breed information and advice. Tonkinese cats have a well-documented love of being at a great height. Ask any Tonkinese owner what they think of their cat, and you’ll see them turn gooey-eyed over their devoted companions. Smart, loving and stunning: Tonks, as they’re affectionately known by their owners, seem to have it all. “Once you meet a Tonk, you understand why fans rave about them,” says Linda Vousden, secretary of the Tonkinese Breed Club, and, as author of two books on Tonkinese, quite the expert on the breed. Janine Davies, the Tonkinese Cat Club’s GCCF delegate, adds: “They’re the clowns of the cat fancy. They’re complete entertainers and people cats, and they thrive on company from both humans and other animals. These gregarious cats have good intuition about their companions as well. Janine’s first Tonk, Orlick, became the first Pets as Therapy (PAT) cat in the country in 1998. She recalls: “It was during the AIDS crisis and we would visit the hospital. This sociability can cause problems though — if you decide to allow your Tonk outside, consider cat-proofing your garden so they can’t roam. As Janine points out, these cats will say hello to anyone, so there is a risk of theft on top of the usual worries of missing cats and road accidents. Tonks are highly intelligent and can be trained to retrieve and walk on a harness, among other things, so it’s no surprise that the breed has earned a reputation for being particularly dog-like. However, any prospective owner should be ready for endless curiosity from their clever kitties. “They’re interested in everything and some people could find that intrusive,” admits Linda. “You need to be prepared for them to be involved — they won’t just sit looking pretty. If you put a handbag on the floor, you’ll find a Tonk in it when you go to pick it up! Tonkinese cats are of a medium-build, foreign type, with long, slender bodies and triangular-shaped heads with larger ears. Their silky, close-lying coats come in a range of colours, including brown, blue and red, along with their dilute options, and in tabby and tortie varieties. Tonks have three coat patterns now accepted by GCCF: Burmese Colour Restriction (BCR) or solids; Colourpointed Pattern (CPP) or pointed; and Tonkinese colour restriction (TCR), otherwise known as mink or intermediate. Their eye colour is determined by the patterns too: BCRs have shades of yellow and green, CPPs have blue, and TCRs have beautiful aqua peepers, unique to the cat fancy. Mistakenly believed to have hailed from Canada, Tonkinese cats were actually first acknowledged in the cat fancy as ‘Chocolate Siamese’ in the 1880s. In 1930, Dr Joseph Thompson looked into the genetics of his cat, Wong Mau, who was imported to the USA in 1930. 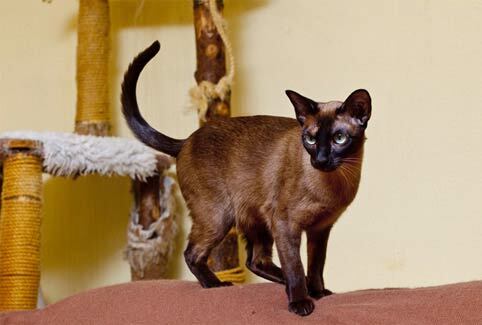 He described her as a hybrid of the Burmese and Siamese, although this is an inaccurate term — the three breeds are genetic cousins and the Tonkinese shares characteristics with the other two, but its mink coat pattern and corresponding eye colour are genetically unique. Dr Thompson started a Burmese breeding programme with Wong Mau, where the solid and pointed coat patterns were developed. The mink patterns were discarded as pets and fell out of favour, until breeders in Canada and the USA became interested in developing them in the 1960s. These cats were considered a new breed but were in fact a revival of the cat first recognised in the 1880s. They returned to the UK and were recognised by the GCCF as Tonkinese in 1991. The breed won more than 1,400 merit certificates before being granted championship status in 2002. All three coat patterns were accepted in 2014, after over two decades of support and campaigns from Tonk fans. Tonkinese are hardy and healthy and there are no inherited diseases associated with the breed. As long as you keep up with flea and worming treatments (even for indoor cats) and make sure your cat has a good diet, you shouldn’t have too many problems — although every cat is different. Tonks are very good at self-maintenance and their coats won’t need a lot of grooming. Regular stroking should keep their coat looking great, and the occasional groom with a rubber-tipped brush will keep them in tip-top condition. Most Tonk kittens will be available for between £350 and £400, depending on which vaccinations they’ve had. 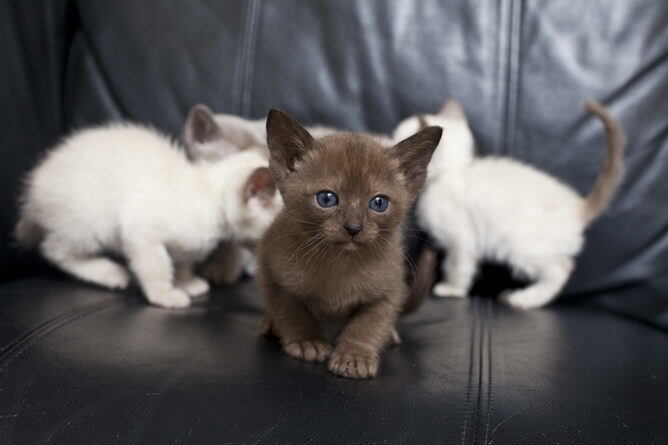 There are breeders all over the country, so check both clubs’ websites to find the best one for you at www.tonkinese. info and www.tonkinesecatclub.co.uk — always buy from a breeder registered with either GCCF or TICA. See the litter with their mum if you can; the kittens should be outgoing, playful and friendly. It can take a year or more for their eye colour to develop and their coat patterns can take up to two years, so bear that in mind when choosing your kitten. Is the Tonkinese the cat breed for you? Tonks thrive on company, so they will fit in well with many households — single people, couples, families with children and the elderly can all be happy Tonk owners, as long as they realise that this breed will insist on being involved with everything and everyone. They will also get on well with other cats and dogs, and will need such companions if you’re out of the house a lot. They can be kept as indooronly, but if allowed out, it’s recommended that you catproof your garden. The most important thing to remember: as long as you give your Tonk the love, attention and entertainment he deserves, you’re guaranteed to see it returned in spades.